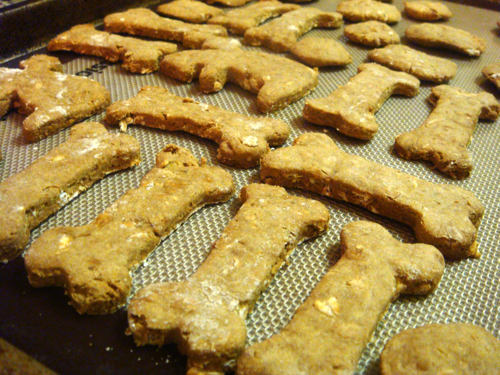 I love making homemade dog treats for Stella puppy because it’s fun, she really loves them, and I know what ingredients she is eating (not that dog treats are particularly good for her, but at least she isn’t getting any preservatives or food coloring!). I also like making a double batch so there are extras for Stella’s friends. Preheat your oven to 300º F. For one batch of these treats, mash up one banana in a large bowl. 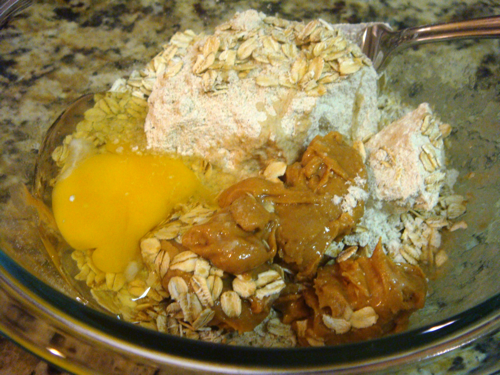 Then add 1 cup of oat flour, 1/3 cup of rolled oats, 3 tablespoons of peanut butter (consider making your own! 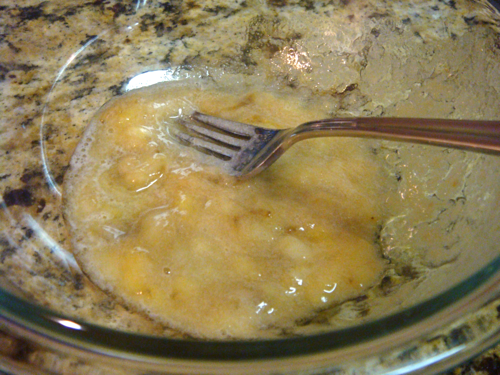 ), and 1 egg to the bowl. I found the oat flour at a farmers’ market, but I’ve also seen it in regular supermarkets. Mix it all together until it is well-incorporated. Because there aren’t many wet ingredients, this dough can be tough to mix. It is easier if your peanut butter is at room temperature, and I think it’s perfectly acceptable to use your hands if you want to. 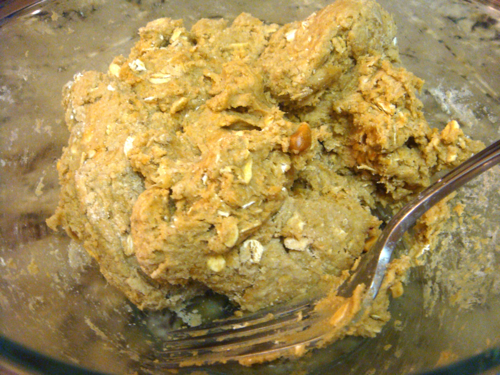 After your dough is mixed, you can start forming the treats. If you want to make simple coins, just roll a little bit of it into a ball and flatten it down into a disc. I wanted to use the cutest dog-themed cookie cutters for these treats, so I rolled out all of the dough until it was 1/4 inch thick. 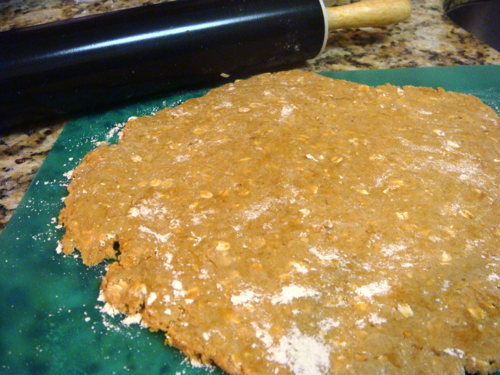 I also sprinkled some oat flour on my board and rolling pin to prevent it from being too sticky. 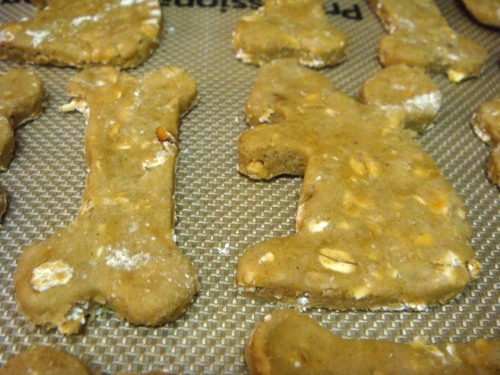 Once the dough was uniformly flat, I used squirrel and bone cookie cutters to make the treats. Both Stella and I LOVE squirrels…but for different reasons. I want to cuddle them and feed them peanuts (is it weird if I make squirrel cookies for humans later? 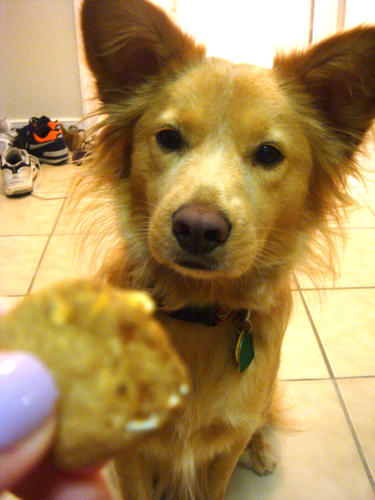 ), but Stella wants to chase them and probably eat them. 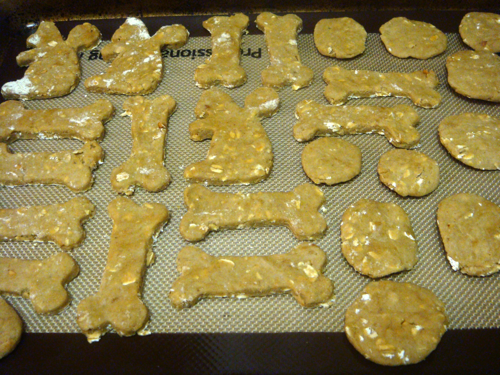 I put the treats on a silicone baking mat, but tin foil works perfectly well too (they don’t stick). You also don’t have to worry about spacing the treats out because they don’t spread either. I made coins out of the leftover dough. Put the treats in the oven for about 40 minutes or until they start to brown. Let them cool completely before giving them to your puppy. The treats can be stored in the freezer for later use, or they can be kept in an air-tight container in the fridge or on your counter. 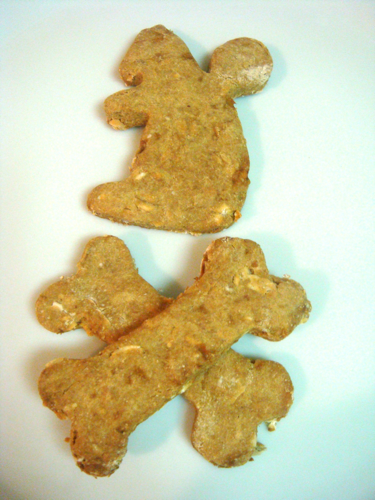 These treats have been given two paws up by Stella, Tank, Tyson, Rocco, and Rosa. David, however, says they’re a little dry. This recipe was adapted from Whole Foods. There will be more treat varieties featured here in the future because David’s sister gave us a whole book of recipes (and the awesome cookie cutters). I just need to track down some brown rice flour first. Read an update of this post here! Stella is a lucky dog!